If you appreciate innovation and free speed, then pay close attention; the future is here. Dynafit’s partnership with Pierre Gignoux, a highly decorated French skimo racer and mad boot-scientist, has been fruitful. The DNA Pintec boot is a wonder to behold. Pintec is an entirely new tech-system that enables crazy weights, super-fast transitions, and better responsiveness. Take the traditional Dynafit toe and heel system and flip it inside out: that’s the Pintec system. The toe of the boot features two spring-loaded cartridges, one on each side, that stick outward and slide into the recessed holes in the binding. 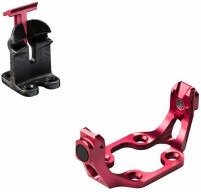 The binding toe is incredibly simple with scarcely a moving part; just a solid block of aluminum. The heel uses a small ramp to force the heel piece open which then snaps shut for secure skiing while still allowing for lateral release. 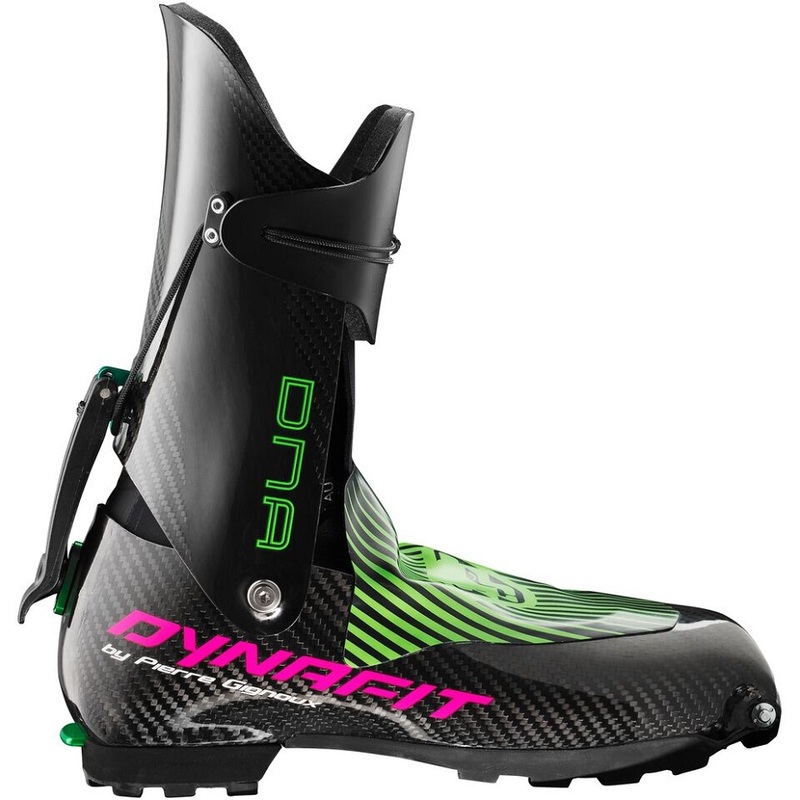 The new binding system is hogging the spotlight, but the DNA race boot remains one of the most advanced and highest performing boots on the market. Use it on small skis, use it on big skis, use it when the temperature plummets, use it for summer skiing, use it anywhere you please. Just promise not to kick too many rocks with the carbon fiber shell. The DNA Pintec boot is perfect for those of us that enjoy skiing more vertical feet per week than an average resort skier. Bikini liner provides totally unrestricted walking capabilities. Internal lacing system locks your heel down for control on the way up and down. Full carbon shell is stiff, transmits power, and is light, light, light. Palau race liner is heat moldable for decent comfort at minimal weight. Compatible exclusively with Dynafit’s P49 binding. Hi Eric! Sadly, we haven't yet received ours, but we don't know of any major changes to sizing. There is just the usual variability of handmade boots. How wide is this boot in the forefoot? I have heard that this is one of the higher volume carbon boots out there but have not had a chance to put them on. Is this guy consistent with the other PG boots? Hi Aaron, since this boot hasn't landed I can only work off of what we have been told so far. It's based off the previous PG designs and we expect it to fit the same as the other PG designed boots, which are the widest carbon boots out there. The volume of the these boots is a little larger over the instep than many other carbon boots but is still relatively low in volume. I have used this boot a few times and have realized that the forefoot width in the toe box is somewhat wider than in the previous PG from 2018. The midfoot is also quite wide as well. The forefoot volume is very low. It feels snug and means that my forefoot does not move around very much. Generally, these boots feel like a snug slipper that was made to fit my foot. For reference, the previous 2018 PG was slightly narrow on my foot. What is the 28 in US sizes? Hi Steve, it roughly translates to a US size 10 men's shoe. Mondopoint sizing, which ski boots use, is essentially based off the length of the foot in centimeters. 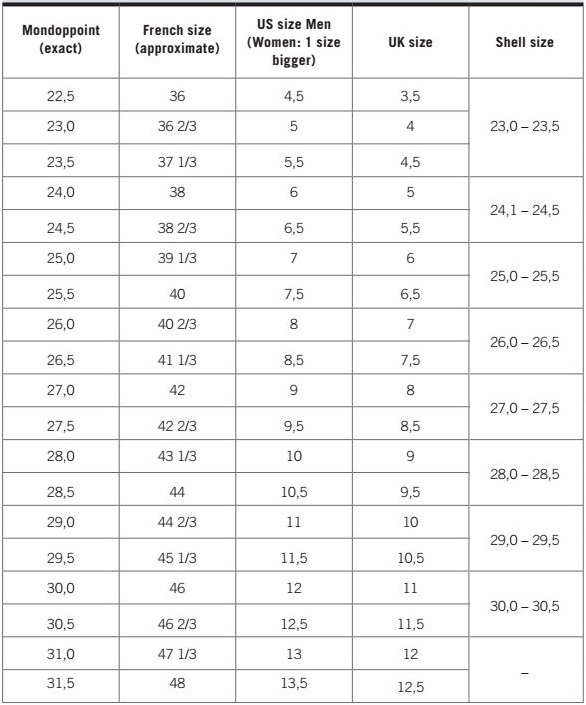 For a more accurate picture of what size you would want, I strongly suggest that you measure both of your feet in centimeters and choose the size that most closely correlates. I asked PG, and they requested that I measure my feet in milimeters. They suggested a size to me, and that size fit perfectly. I am not promising a perfect fit for anyone who does this process. I am only impressed that my foot seemed to be able to fit into a slightly smaller mondopoint sizing in this boot than in other boots.